Yesterday I was looking for some kind of badge for the Camp WriMo. Didn’t find any! However! Oddly enough, have I already written todays task. 702 words. My “normal” writing time is during evenings, and sometimes quite late. So at the moment a feel a bit off. Haven’t been outdoors today and havn’t done anything ordinary. Now I’m just pondering what to do with today’s text and what updates I might wanna do on the blog concerning my Camp. But I have the rest of the day to ponder that. But soon I’ll bike to my grandson, to take him to the doctor. Doesn’t the version I created look quit nice too? Oh, my goodness! I wish I HAD a beginning! At all! Even if it were the worst of all times! Ciao! Today is a “Five for Friday” post, and I thought it might be fun to see how a novel begins. I don’t know about you, but I find beginnings to be difficult. I’m an outliner, so I have a plan when I start and I know what I want. But getting in the groove and finding just the right way to open the book? It takes me a while. 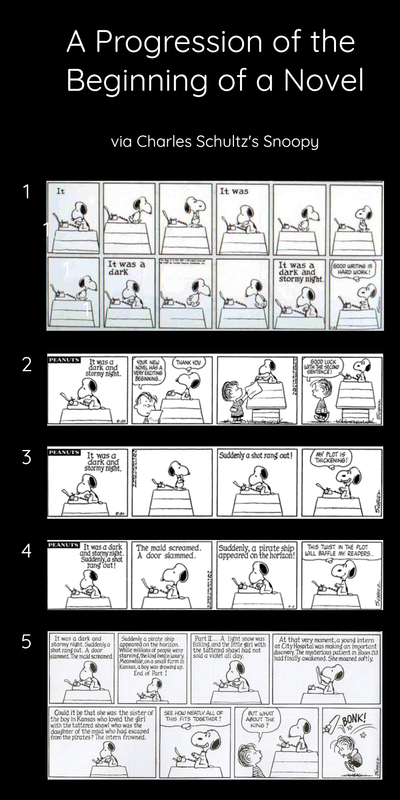 I thought we could look at the progression of beginnings today, as penned by one of my favorites: Snoopy. Awoke Tuesday morning with a sore throat. On the spot a week after the last cold had left me. That one had a lot of muscle pain, and stomach trouble and icky fatigue to and fro, and just enough snottiness to tell me it probably was due to some kind of cold virus. This one feels different, more like a real cold with a heavy head, runny nose and all. Don’t want to do anything during the daytime but stay on the sofa. Last time I had a more severe and long-lasting cold, was exactly three years ago. So after this, I’ll stay clear from any cold at all, for the next couple of years, shan’t I? I put this upon myself, in a way. Like a month ago, when beginning to feel a bit off, I begged out in the blue that if it was necessary for me to catch a cold, please let me suffer from it in a period I don’t have the duty to drive my grandson! This week he is on vacation at some skiing resort in France or somewhere. At least the name of the place, which I forgot as soon as he had mentioned it, sounded french. I could be Switzerland as well. During the previous cold-period. I was lucky. The circumstances made it that I only had to drive him a few afternoons, and the rest of the time I could spend on my sofa. So I guess one gets what one asks for. I also guess it was necessary. Boosting the immune system. After the first cold I felt better and stronger than I had done before those weeks, so when this cold is over I’ll for certain feel over the top strong and healthy!